The last friend Buddy brought home was a beautiful tuxedo cat I decided to name Mr. Tux because of his elegant mannerisms. He was my Gentleman Kitty and came declawed. I always knew when his little feet were bothering him by the way he gingerly walked. He had a very distinguished air, and earned the nickname Mr. Carson, the butler from Downton Abbey, who hated change, liked things in order and conducted himself with honor and dignity. Sadly, we lost our Tuxerpoo on April 15, 2017 due to kidney disease. I miss all of my departed babies, and Tux is no different. 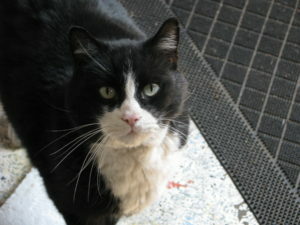 The other cats, however, still miss him and Jackie in particular goes looking for him from time to time. She sure looked up to him! Mr. Tux, making sure all is in order.